LEWISTON - Margaret C. Lavoie, 88, of Lewiston, died on Wednesday, Feb. 6, 2019 at D’Youville Pavilion with her loving family by her side, following a long illness. 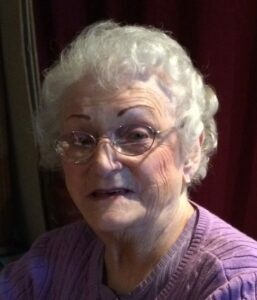 LEWISTON – Margaret C. Lavoie, 88, of Lewiston, died on Wednesday, Feb. 6, 2019 at D’Youville Pavilion with her loving family by her side, following a long illness. She was born in Brooklyn, N.Y. on Jan. 16, 1931, the daughter of the late John A. and Catherine (Goldner) Eppig, and had been a resident of this community since the early 1960s. She was employed for 32 years at Central Maine Medical Center in Lewiston. Margaret was a member of the The Unity Bible Church in Lewiston and the Robin Dow of Auburn. She enjoyed playing beano, watching sports on TV, especially the Boston Celtics and most of all enjoyed going to her grandchildren’s sporting events. She is survived by two daughters, Katye Vachon and her husband Raymond of Lewiston and Deborah Vachon and her husband, Roger of Lewiston, one son Patrick Dumont and his companion, Diane Marcoux of Lewiston; 11 grandchildren Denny, Kelly, Sarah, Nya, Meghan, Mallory, Tammy, Lyndsey, Cameron, Courtney and Shaelie; 13 great-grandchildren; and many nieces and nephews. She was predeceased by her daughter, Victoria Boehm who died on June 12, 2016; and three brothers, Hank, Leonard and John Jr. The family wishes to thank the nurses at D’Youville Pavilion and Dr. Lui and her staff for the wonderful care they have provided for Margaret. Funeral services honoring Margaret’s life will be celebrated on Saturday at 11:00 AM at the Pinette Dillingham & Lynch Funeral Home. Committal prayers will then follow on Monday at 11 a.m. at St. Peter’s Cemetery. Visitation will be held on Friday from 4-7 p.m. at the Pinette Dillingham & Lynch Funeral Home 305 Alfred A. Plourde Parkway in Lewiston. 784-4023.